You know the feeling you get when you see a room that speaks to you? A room that perfectly represents the way you want to live? Well, this is how I feel about these garden pavilions at the Parisian home of Pierre Bergé, business partner of Yves Saint Laurent. Designed to accommodate a study and a dining room, each pavilion is a glorious mix of glass and antique mirrored walls, priceless Louis XVI antiques, non-pedigreed pieces, and stylish bibelots. In lesser hands this mélange could come across as a hodge-podge, but here the look is chic, timeless, and comfortable. Now wouldn't having a study like this make work seem much less taxing? My favorite pavilion- the study. The 18th c. black console by Adam Weisweiller holds a Sèvres tea service. The portrait is of Jean Cocteau. The veranda which connects the two pavilions. The cafe table and chairs are by Diego Giacometti. 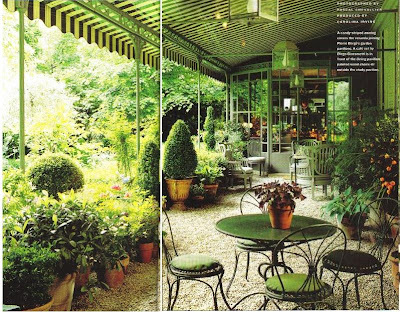 And what's more classic than a striped awning? These speak to me to me as well! So inviting. Gorgeous. I can totally see myself spending some time on that leopard chaise, or having tea and scones in the morning on that veranda. This must be France. To live as beautifully as Bergé does, with all that dustable stuff, surely requires staff. Lots of staff. Maintenance and organization are big parts of the foundation of great style; without it, even the most beautiful room would be a wreck within 24 hours. djellabah- I agree. You need staff, or you need to make the time to clean and keep things looking fresh. I suppose that in an unkempt home bibelots become tchotchkes?? Didn't Albert Hadley lament the fact that many people today don't maintain homes as they should? 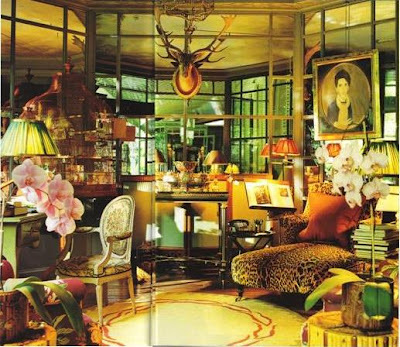 I love Pierre Bergé's style . He now owns also an auction house in Paris .He knows so much about style. Mélanie- I did not realize his owns an auction house. He certainly has a lot of business acumen! I'm not sure I'd ever leave my room. Wow! And thanks for the images; the veranda is a more complete version of the vision that Mrs. E. and I have been fiddling around with for five years now! I'm forwarding the post immediately. E and E- Me too! I think the veranda is VERY charming! Based on the way my apartment looked this morning (with child and dogs wreaking havoc), Albert Hadley's comment is doubtless true, but I wonder on the observations of which homes he based that comment. Surely he's not referring to average households in America. With all due respect for a designer whose ideas I admire, presumably he spends most of his time among the upper crust and with otherwise privileged individuals. Perhaps his comment about the demise of maintenance has more to do with the skills of household staff today than with the average homeowner's own imperfect attempts at sweeping and dusting. It is good to remember that the sensational style of the past that we revere had a lot to do with hardworking individuals who were paid to dust, cook, iron, wash, polish, and otherwise keep in top condition glamorous houses and apartments that were not their own. And don't forget the preponderance of tastemakers of the past whose children were off at boarding school for much of the year, which certainly helps when the subject turns to maintenance. 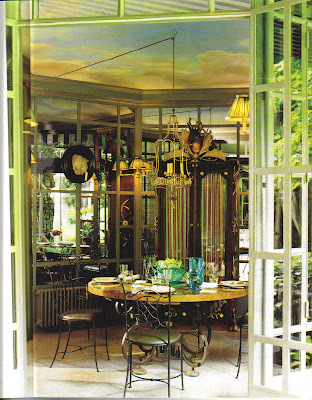 I love style history and I thrill to glamorous rooms like anybody else, but there are always the footnotes to consider. Let's face it, almost all of the rooms and homes posted on design blogs need intensive maintenance and housecleaning. Is it not sooooooo sad that House and Garden is gone! It was a fabulous magazine. (And Blue Print has hit the dust also). An excellent comment above about a clean house (wish I had one all the time). Even the most unassuming interior looks 100 times nicer if it is clean and sparkling! But who has the time??? djellabah- Yes, when you have a large staff and your children have been shipped off to boarding school, your house will look immaculate. I hope that there is a happy medium- that we can have stylish homes that have flair and that are easy to maintain. As much as I love the idea of tenting a room (and I DO want to try this someday), it's the thought of having to vacuum and dry clean all of that fabric that makes me a bit apprehensive. I just don't have the time (or the large staff!). Anon and Cat- Everything does look better after a good scrub. What would be interesting is to see how these rooms look on an average day. Now that might make all of us feel better about our own homes! I remember visiting a castle in Europe when I was a child. They had us wear felt scuffs over our shoes to help maintain the floor's shine... Just a thought for your next open house. Anonymous, I agree; however, I was only commenting on Albert Hadley's observation, not blogs. E and E- They've now started to require guests at many Decorators' Showhouses to wear booties over their shoes, but this is entirely in order to avoid scratching the floors. I wanted to add that Pierre Berge was a central character in the book "The Beautiful Fall", which is an account of the rivalry of Yves St. Laurent and Karl Lagerfeld, and the Paris fashion scene in the 70s. It's a fascinating insider's look at that era, and indicates that the relationship between Berge and St. Laurent, was romantic as well as business - until they had a falling out. Topsy- That is a fantastic book! I devoured it in one day while lounging on the beach. It was interesting, but gossipy too! I agree with djellabah and p of c...not only was the staff highly trained (and numerous)but children were either away at school or at another house. Do you think any children spent much time in the Paley's fabulous paisley tented (or was it just curtained? I don't have the photo here) St Regis sitting room? To my mind the trick today, with our limited (and frequently indifferent!) staff, is to achieve style without being a slave to maintenance. And...in terms of hospitality, being anxious about someone's Jimmy Choos scratching the parquet?!! I doubt that children actually were seen much in those rooms, if ever, re the Paleys. They had six children between them: two from his first marriage (Jeffrey and Hilary, who were grown by the time of the St Regis suite and Jamaica residence), two from her first marriage (Stanley and Amanda, who were at boarding school), and two together (Bill and Kate, who also were at school or with nannies in the 1950s and 1960s). And believe me, back then, children were seen but not heard ... actually, rarely even seen. The house in Jamaica would have been used only for holidays, so would have been hardly used during the year at all (Ralph Lauren owns it now). And the St Regis room (it was tented and curtained/gathered) was only theirs for only a few years in the late 1950s/early 1960s, I believe; eventually they moved into a Fifth Avenue apartment that was renovated by Jansen and decorated by Jansen and Parish Hadley. Small aside: Remember the glamorous photograph of Babe holding a cigarette in her St Regis living room in 1964 (I think)? Can you imagine how those fabric-covered walls held that odor?! Not enough Rigaud candles in the world could cover that up! Morris- Agree! Being hospitable should be the number one priority (meaning grin and bear it when someone spills red wine on your light-colored rug!). djellabah- I have always admired the St. Regis living room, but did not think about the odor issue! And this was in the days b/f Febreze! That middle image is stunning... I can totally imagine you there! Jennifer - The study, which I hadn't see before, might be one of the top ten rooms ever. It has you written all over it. Creative, inspirational perfection. Aww, thanks Patricia! It's definitely a fantasy room!! Boy I think a lot of readers are feeling guilty about their housekeeping skills! Oh, and I htink the garden was designed by Madison Cox. Mister- Perhaps we ought not to be so hard on ourselves! And thank you for the info on Madison Cox- anytime I see his work I always do a double-take. Love the bottom photo especially. The awning reminds me of the on in Renoir's Luncheon of the Boating Party. I love the gravel with the plants in pots as well as the cafe table and chairs. I could linger there quite a while. What a pity that so many comment posters are trapped in their fears and prejudices about the maintenance and the need of staff. Is it so difficult to just enjoy style nowadys? At least try ladies and gentlemen! Time to Revisit Laura Ashley?